In a large skillet, fry bacon over moderate heat until crisp, drain on paper towels, crumble, and reserve. Pour off all but about 2 tablespoons of fat from the skillet, add hominy, and stir until golden, about 5 minutes. In a bowl, whisk together eggs, salt and pepper until frothy, add mixture to hominy, reduce heat to low, and stir until the eggs are set but still moist, 5 to 7 minutes. 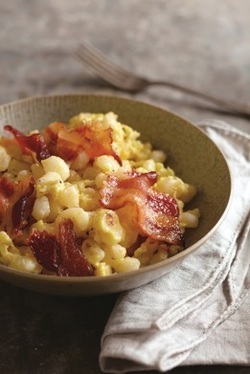 Transfer eggs and hominy to a serving bowl, sprinkle reserved bacon over the top, and serve immediately.